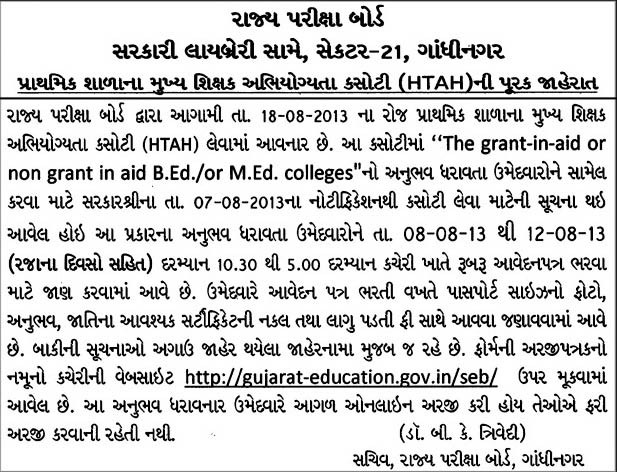 State Examination Board of Gujarat published important notice for HTAT Exam, 2013. Now, Experience of “The Grant-in-aid or non grant-in-aid B.Ed. or M. Ed. Collages” are also allowed as per Government’s notification (Dated 07/08/2013). Affected candidates may apply for HTAT, 2013 exam between 08/08/2013 to 12/08/2013 (Except holidays) at office of State Examination Board in person.